Seabrook House celebrates 40 years as anchor for the recovery community. The day Seabrook House opened in 1974, a young woman walked through the door with two little boys. She wanted to know whether the brand-new alcoholism and addiction treatment center in rural Cumberland County, N.J., could help her husband. Seabrook cofounder Margaret "Peg" Diehl gave the visitor the answer she'd learned by heart in the 1960s, when she was struggling to raise her sons while her husband's drinking threatened to destroy their lives - and his. The woman's husband could be offered treatment, "but her family needed help, too," Peg recalls. "I had been told I needed help after my husband got sober, and I did. I was pretty messed up." Now 86, Peg will be honored Saturday at Seabrook's 40th anniversary. 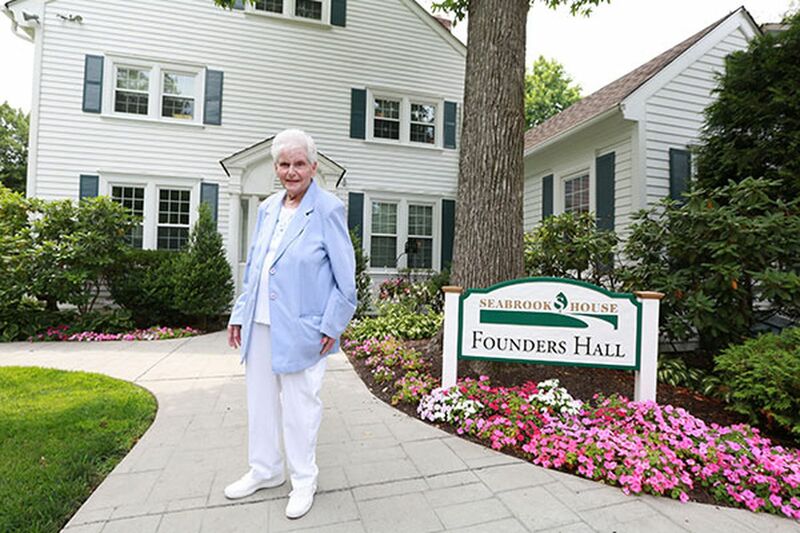 The rehab center she helped establish is an anchor for the recovery community, and about 350 alumni, some of whom have become her friends, will be among the nearly 900 guests. I received my own treatment elsewhere, but I've known Peg and her son Ed for years. Peg is as down-to-earth as ever as we chat at the leafy Seabrook campus in Upper Deerfield Township, where she worked for 36 years. "Hon, I did a lot of interventions," says Peg, who retired from Seabrook in 2010, largely as macular degeneration began to compromise her eyesight. "Families need to understand that they didn't cause alcoholism or addiction, they can't control it, and they can't cure it," she continues. "The alcoholic or addict has to work on their own sobriety. "When I was pregnant with my youngest son, I told my husband, 'This baby is not going to have the constant worry his four older brothers have had. If I have to leave you, I will, and I'll take the kids with me. The family is going to come first.' "
Al-Anon, founded in 1951 by Lois Wilson and Anne Smith - whose husbands, Bill and Bob, cofounded Alcoholics Anonymous - has long been an essential source of support for the spouses of alcoholics. Ed Diehl, who is Seabrook's president, says their facility was one of the first rehabs to focus on holistic family treatment. "My mother's experience and vision really gave Seabrook its start," says Ed, who remembers what life was like before his father got sober in 1968. Jerry Diehl died in 1989. "We had been living hand-to-mouth," Ed says. "My dad, who had been a brilliant student at Wharton, ended up delivering milk on the north side of Atlantic City. My mother ironed our little white shirts for Catholic school in the morning before she left for work herself." Peg's insistence that their treatment program educate and counsel family members, he adds, helped the founders obtain a federal demonstration project grant that got Seabrook House off the ground. What began in 1974 as a single building with beds for 12 patients has grown into a 100-bed complex of nine buildings, including detox and long-term residential treatment. Seabrook has a second residential facility in Westfield, Pa., as well as outpatient programs on the main campus, in Cherry Hill, and in Northfield. "The need is as great as it's ever been," says Ed, adding that rehabs "have never seen anything as virulent" as the addiction to heroin and other opiates among the young. While treatment at Seabrook has evolved to include mindfulness meditation, equine therapy, and yoga, the core remains permanent abstinence from alcohol and drugs through the 12 Steps pioneered by Alcoholics Anonymous in 1935. The emphasis is on accepting responsibility, taking action, and making changes. "The message hasn't changed," says Peg, who practices what she preaches: She still attends a 12-Step support group for family members of alcoholics. "Every Tuesday at 8 p.m. in Ocean City. A friend of mine takes me," Peg says. "It's a way of life."